Centre Dentaire Hanna has been offering you their expertise since 1993. Focused on closeness and accessibility, we strive to maintain a trusting, long-term relationship with our patients. We look after your comfort and receive you in a warm and professional atmosphere. Our staff works hard to offer you the best possible service and to answer all your questions. For over 24 years, Centre Dentaire Hanna has treated both children and adults, and our dental treatments are suitable for the whole family. Our many years of experience allow us to offer you superior care, whether in general dentistry, dentistry for children, or putting in crowns, bridges, or dentures. Our team treats you and your children using a novel and educational approach to give you the best possible experience. Dr. Sami Hanna graduated from the faculty of dentistry at Université de Montreal in 1992. He founded his clinic in Laval in 1993 where he still practices. 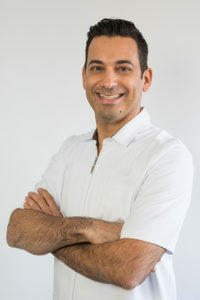 Dr. Hanna is a member of the Ordre des dentistes du Québec, the Association des Chirurgiens Dentistes du Québec and the Société Dentaire de Laval. From the very beginning of his practice, Dr. Hanna has developed a great passion for dentistry, and has continually upgraded his skills and knowledge in several areas through continuing education programs. Surrounded by an exceptional, dedicated and professional team, Dr. Hanna is always listening to his patients. Attentive and empathetic, he has good values and his work ethic is impeccable. His gentle and caring personality allows patients to feel comfortable throughout their treatment.